On March 1, Idea Mia partners Marco Cucco and Alessandro Campanati introduced the latest and greatest packaging for its biodegradable wine diaper – The Jet Bag. 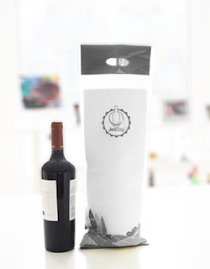 The updated packaging, which was revealed at the 2012 International Home and Housewares Show in Chicago, gives a modern look to the bag that saves your wine on long trips. And this isn't the only updating the Jet Bag will see this year. Later this year, you can look forward to seeing the same technology applied to other items that need to be cared for during travel as well. With steady growth expected over the next 12 months, make sure to keep your eyes peeled for what Jet Bag and Idea Mia plan to launch this year.